I found this recipe on Kraft Foods website a few years ago. It is SO GOOD and very filling! I actually love to make it for dinner sometimes since it is so filling. -MELT butter in large skillet on medium heat. Add potatoes, green pepper and onion; cook until potatoes are lightly browned, stirring occasionally. 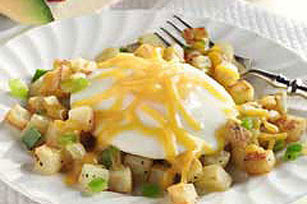 -ADD eggs, 1 at a time, to potato mixture, spacing eggs evenly over the potatoes; cover with lid. Cook until eggs are set. -SPRINKLE with cheese. Cover and continue to cook until cheese is melted. I found you from another site. I love your site. I can't wait to get to know you better. Stop by when you get the chance. I have a Meet Me Monday blog hop and I would love if you could join in. Hope to see you then!